Pioneers in the industry, we offer ppr pipe from India. 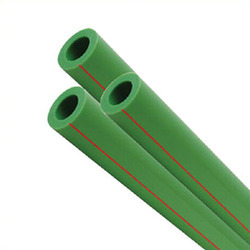 We are a coveted firm engaged in manufacturing and supplying PPR (Polypropylene Random) Pipe. Our dexterous professionals design and manufacture these products keeping in mind the international quality parameters. Used for various industrial applications, these products are offered by us in various sizes and specifications. Moreover, our offered range can be customized as per the specifications of the cents for their maximum satisfaction. Looking for Polypropylene Pipes ?